Alfredo is a seasoned, bilingual (Spanish and English) banking professional with over 20 years of successful business banking and commercial lending experience. He has managed numerous portfolios simultaneously ranging from large public sector clients and agencies to small business owners. 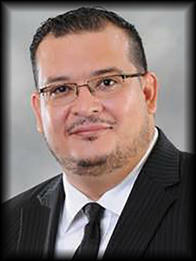 He also has extensive experience in the franchise and large commercial real estate sectors. He takes a strategic approach to each role he has held: business banking relationship manager, business development officer, commercial treasury solutions officer, business banking client manager CDG, and customer service business banking contact team manager. His goal is to meet and exceed his clients’ business and personal goals. Alfredo graduated from the University of Buffalo with a double major in English and Political Science. He lives in Tampa with his wife and three children and enjoys spending his free time with them. All of his children are fully bilingual in both Spanish and English. He is also an active member of his community serving as a board member for The First Baptist Church of Carrollwood, Tampa participant with The Hispanic Organization for Leadership and Advancement, and volunteer for The Boys and Girls Scouts of America.